A man on a mission with a big story to tell, this is Brit bluesman Gunn's fourth album and first on Market Square. It's a blues rock album with fire and soul, brimming with strong compositions, memorable hooks and melody lines and some fabulous playing: but then Gunn has the credentials. A precocious and then prodigious talent, he's supported Buddy Guy at the Queen's Hall in Edinburgh; jammed with Albert Collins in London and backed Geno Washington at the first Belladrum Tartan Heart Festival in his native Scotland. He's also played alongside The Sensational Alex Harvey Band, with members of Gary Moore's Midnight Blues Band; with The Daintees' Martin Stephenson and toured regularly with British Blues harp legend, Errol Linton. Those credentials are reflected in this, his latest release, backed by a crack support team, fronted by Gunn's exquisite guitar work and warm husk of a voice, beautifully-produced by Martin Stephenson. 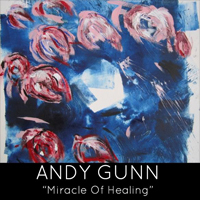 'Miracle of Healing' affirms Andy Gunn as a true guitar great of the old school - and a living blues legend of the modern age.